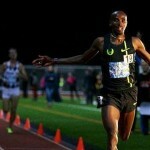 Double European champion Mo Farah (coach: Alberto Salazar) recorded the most outstanding performance of his career to date with a new European and British 10,000m record of 26:46.57 to take victory in Round 4 of the Samsung Diamond League series at the Prefontaine Classic in Eugene (USA) overnight. Lining up in a formidable field that saw a total of 14 athletes post new personal best times, Farah – whose previous best time was 27:28.86 set at the European Cup 10,000m in June 2010 – reduced his lifetime best by 42 seconds to eclipse Jon Brown’s long-standing British record of 27:18.14 set in Brussels in 1998, and the 11-year-old European mark of 26:52.30 by Belgium’s Mohammed Mourhit. His victory in Eugene comes just days after he defended his BUPA London 10,000m title on Monday in a time of 29:15, and he says it was testament to his hard work on the training track. “My end goal was to break the British record because it had stood for a very long time. I’ve been working so hard and it has paid off,” said the 28-year-old who hit the front with 1200m to go before winding up the pace. As the pace increased he blew away the challenge of Ethiopia’s Imane Merga who posted a lifetime best of 26:48.35 for second and Kenya’s Josphat Bett in third (26:48.99). The strength in depth of the race saw nine athletes dip under 27 minutes with the tenth placed athlete, 18-year-old Kenyan Geoffrey Kipsang of Kenya, setting a World Junior record (subject to ratification) of 27:06.05. 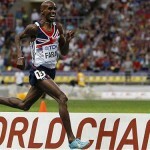 Farah’s sights are now firmly set on a medal at the IAAF World Championships in Daegu, Korea, in July: “I want a world medal and if I keep working hard, I’ll be in the mix,” he said. 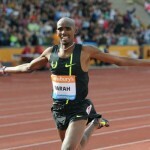 European indoor 5000m record holder Farah will return to home soil later this Diamond League series to take on the 5000m at the Aviva Birmingham Grand Prix on 10 July and the Aviva London Grand Prix on 5-6 August.